If you like in-depth product reviews, and you just happen to be a Mac user, you'll want to read John's OS X 10.9 Mavericks review. 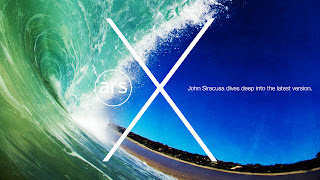 John is well respected in Apple circles and his latest OS X review is smart, accurate and a great read. You can read it on the Ars Technica website, but I chose to purchase the iBooks version so I can not only get the iBooks features while reading the review, but to also throw some cash his way. If you haven't read his review already, you should check it out. You can follow John on Twitter @siracusa, on the Accidental Tech Podcast, and on the Ars Technica website.